No, My Child Does NOT Have to Hug You and our Hi, Hug, Handshake and High Five system that empowers our kids to listen to their bodies but also learn to greet others. When we first arrived in South America he was only 14 months. We lived on the school campus so we were constantly around what he considered strangers (for him anyone not in our family was a stranger). When greeted by our friends or co-workers he’d hide. As a mom, his response was always embarrassing for me–he’d look away, grunt and grunt even more if they persisted in getting his attention. Sometimes he’d get to the point of throwing his hands up at them. I didn’t realize how this culture did things but greeting others with a hug was considered of utter importance and not doing it was utterly rude. “No kissing. I no kiss.” he said in his most fiery voice. When he told me this after another greeting with a co-worker, that’s when I decided I was not going to “force” my children to give anyone physical affection of any kind. I was not going to coerce any of my boys to greet others with a hug or kiss even if it meant that I would be criticized as a mother. Even if my children would be considered rude kids. 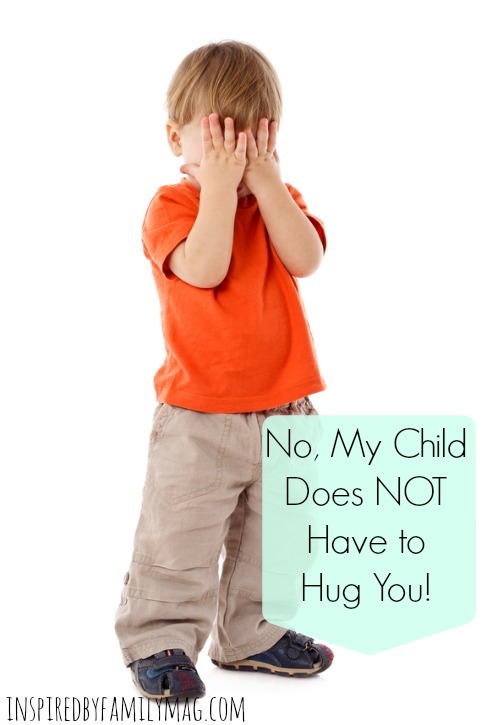 Your child may not be in the mood to hug anyone. There’s no reason for it, other than they just don’t want to have that type of intimate exchange with that person. This is fine and it’s their right. I know this is hard when it’s grandma or your favorite Uncle Tom. Whatever the reason don’t force them to do something different from the own boundaries they have set up for themselves. We need them to trust their internal natural danger instincts to keep them safe in this world. I definitely do NOT want to send this message to my boys. I want them to be able to say “NO” when they need to say no and someone is wanting to hurt them. Encourage your children to trust their own instincts. We send double messages to our children when we tell them that no one should force you to kiss them or hug but then as parents we “force” them to kiss or hug Grandma Sue. You know that aunt Lucy is a sweet soul and she will not hurt them, but you still need to respect their wishes and also give them the freedom to listen and trust their intuition, even if it’s off base at the moment. We can give our kids the tools to be their own advocates and also learn how to greet others in ways they are most comfortable. Your body is your own body. became the answer to our dilemma. It still encouraged my boys to greet others but I was also giving them the freedom to listen to their own intuition. My number one priority is helping my kids understand that it’s okay for them to be rude when needed, to set up boundaries and listen to their intuition. Those boundaries are blurred when I coerce them to do the opposite by giving others hugs and kisses when they don’t want to. Thanks to my little guy I was able to see the value in letting them follow their intuition at an early age. I do realize when they are young their intuition maybe a little off base, especially if they just saw a movie and uncle Tom looks like the villain from a scary movie, but nevertheless it’s important we let them set boundaries. We can redirect them along the way and it may open up some good discussions about safety and how their body is their own. Here’s the magical phrase that saved the day in our home: “Hi, Hug, Handshake or High Five”. Letting your child know they can do, Hi, hug, handshake or high five. This phrase works for kids of any age you can also do a fist bump for older kids. I’ve been sharing this message with parents since back in the day when I was a school counselor and taught child safety seminars, but it wasn’t until recently, this catchy phrase stuck: Hi, Hug, Handshake or High Five. I’ve even heard that some teachers post this on their classroom door and ask their students as they arrive in the morning how they want to be greeted. This phrase works because it gives my boys the freedom to decide what is okay and most people aren’t offended by a high-five or a fist bump. 1. They never have to kiss, hug or touch anyone if they’re not comfortable with it. 2. But they do need to verbally greet those who address them. We want to find a balance between using their manners and letting them set their own boundaries. You as the parent can choose an appropriate verbal greeting. Practice this scenario at home. Have your child verbally greet you (the “guest or extended family member). Then let them know they can choose to hug, give a handshake or a high five. If the person moves forward to hug them, but they’re not comfortable with this, let them know they can move back. Then they can give them a high five or handshake. Walk them through this scenario when it happens in real life. If grandma reaches over to kiss your son and he pulls away and draws closer to you, then say out loud so the other person can hear you speaking to your child, “You can practice your boundaries what works for you “hi, hug, handshake or high five” for grandma?” Saying it out loud also helps, so you don’t have to explain to grandma why your child won’t kiss them. If you feel the need to say something to the adult, just remember not to apologize for your child’s behavior in front of your child. You can say, “We’re practicing setting boundaries for themselves.” When you apologize to your friend because he didn’t hug them you’re sending a message that what he’s doing is not okay. Have your child try this on their own. Let them know you are right there with them. Encourage them to immediately give a handshake on their own when someone comes in with a hug or kiss, if they aren’t comfortable with it. If you feel like you need to process a particular interaction, ask your child later not in front of the person. This will help you and your child explore and get a bit more details on why they feel this way. But again don’t make them feel bad for not kissing grandma just listen and assure them. I highly recommend role-playing a situation before you leave the house. Please note, that our Hi, Hug, Handshake and High five routine is not for people who are trying to hurt them with their words or actions. We have a whole different routine for unsafe people or tricky people (people we thought were safe but turns out they are not). Our boys are older now so we expect a bit more from them than when they were toddlers when all they had to do was say “hello”. Now we ask them to look at the person and greet them with their choice of greeting. But our same rule still applies–no kissing or hugging anyone if they are not comfortable with it. What do you do when your child refuses to greet others? Thank you, we just moved to another country and needed some advice on this very topic.